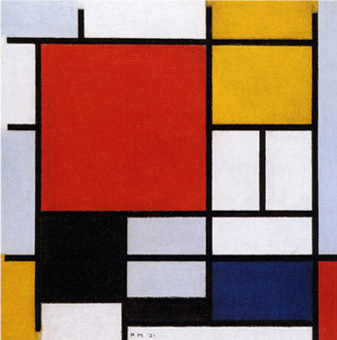 This document is intended for scholars who are familiar with Mondrian's oeuvre. The four paintings above are part of the Haags Gemeentemuseum permanent collection. A brief analysis of these four composition allows to focus on a lifetime evolution from black lines (Pier and Ocean 4) to colored planes (Victory Boogie Woogie), that is to say, from drawing to painting. In Pier and Ocean 4 we see a variety of horizontal and vertical lines generating square proportions in the upper central area. 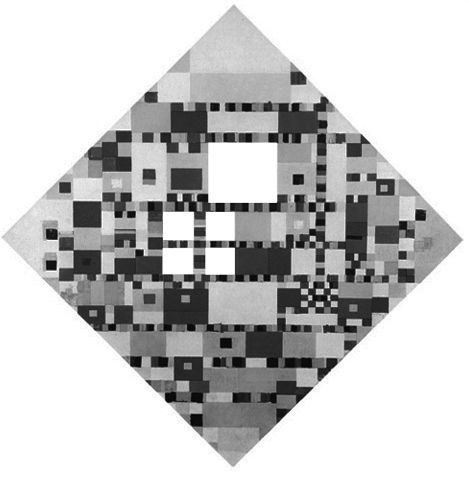 We note a major square in the centre and around that square we see a number of smaller and less evident squares which tend to fade out. The square proportion is a plastic symbol of an equivalence of opposites (horizontal and vertical). The central square conveys an ideal balance which then dissolves into a multiplicity of imbalanced relations between the opposites. The geometry is now sharply defined, the composition consists of black lines and colored planes which are juxtaposed in an asymmetrical way. 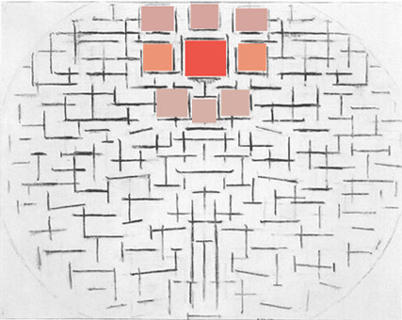 There is no longer a centre; however, a major square is emphasized by means of a large red plane surrounded by smaller square proportions as we see in Pier and Ocean 4. How often in our daily life we do experience imbalance between opposites such as the natural instincts and the intellectual or spiritual issues. We often strive to overcome contrasts with the outer world and reach for an optimal balance and unity within ourselves. We know how difficult such an achievement can be and how many attempts will be necessary in a never ending process. 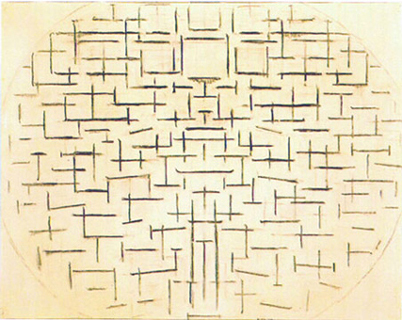 This is one of the reasons why Mondrian wants to visualize a "dynamic equivalence of opposites". This is why the artist comes up with an equivalence (the central, larger square) and, at the same time, he shows situations where that ideal balance and unity changes and slowly dissolves. This happens in Pier and Ocean 4 with the smaller, not fully achieved squares which then fade away. This happens in Composition with Large Red Plane with plane 2 which differs from plane 1 in terms of size and color; with plane 3 (where an horizontal line interferes with the the square), with plane 4 (where a vertical segment does the same), with plane 5 where the color yellow continues toward the top opening up a potential square area which does not have the time to reach the equivalence. 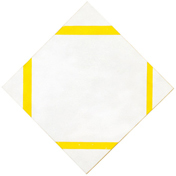 The relation between a well identifiable square proportion and a number of not fully attained squares inspires Lozenge with Four Yellow Lines as well. Four uninterrupted lines cross the lozenge and continue toward an unforeseeable space beyond the canvas. 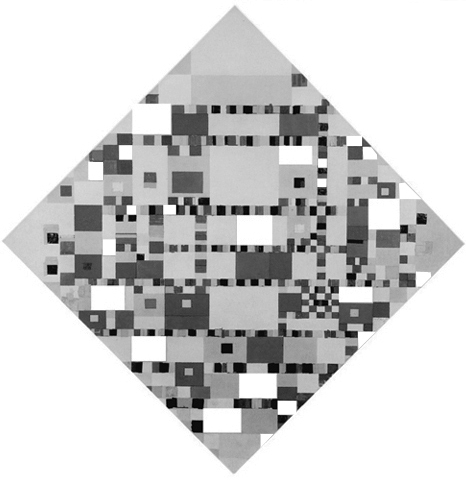 For the first time in a Neoplastic composition the lines do not intersect visibly on the canvas; we can only presume they do and therefore we talk about a square which we do not actually see in full. Each individual line, which shape one side of the square, may well be part of an infinite space. 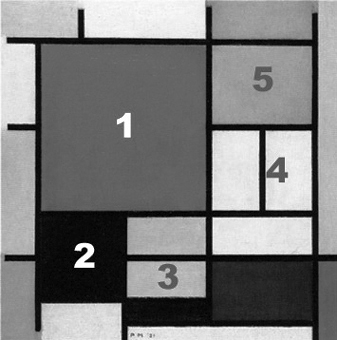 By establishing a relation among four infinite lines, our mind generates a finite square. The four lines show a progressive increase in thickness as we move clockwise from the vertical on the right. The increase in the thickness can be seen as the vertical incorporating a slight horizontal expansion or conversely as the horizontal growing thicker in response to barely perceptible vertical pressure. For a fraction of a second, the space of each line is simultaneously vertical and horizontal, i.e. a unitary synthesis of the opposite directions. Because of this and due to their color, the lines seem to become planes. On observing this square and contemplating the differing thickness of the lines, we are faced with a unity undergoing transformation from one side to the other. We see a unitary synthesis that already appears comparatively manifold in itself. We perceive a changing unity that tends to become rather than to be. It endures but changes at the same time. As in Pier and Ocean 4 and Composition with Large Red Plane, we are confronted here with one and many squares; we perceive stability and instability at the same time. 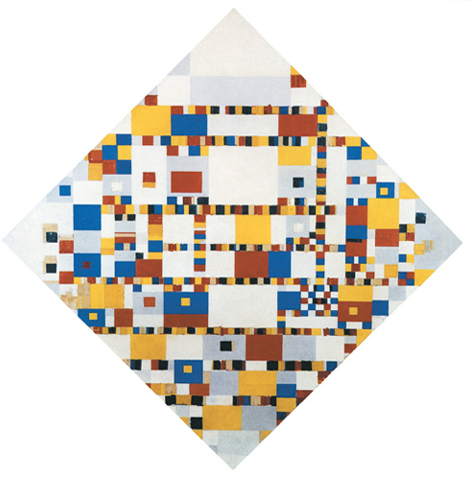 ﻿From 1914 to 1933 the multiple space of the Pier and Ocean 4 appears to have been completely absorbed by the square of Lozenge with Four Yellow Lines, ﻿a unity designed to express both the one and the many. With colored lines changing also in thickness, this square alludes to multiplicity without, however, showing it in all of its far greater breadth. The variety found in the Cubist works as well as in the first Neoplastic works - an aspect to which the artist had always been very sensitive and which formed the starting point of his plastic explorations - was absent in 1933. This is why, from 1933 to 1942, Neoplastic space progressively will open up to an increasing number of elements. In a period of ten years and throughout not less than 85 new works, Neoplastic space reaches the highest degree of multiplicity ever. Victory Boogie Woogie presents a large amount of colored planes which interact with one another in terms of color, dimension, proportion and position. 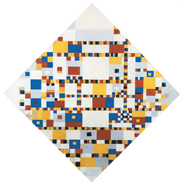 Most of the planes can be observed as potential equivalences of opposites which become fully evident now and then, taking on the shape of white, gray, yellow, red and blue square proportions while undergoing elsewhere continuos imbalances through verticals and horizontals again prevailing over the opposite direction. Everything changes according to the context. From a substantial point of view we have here in a new, more complexed, unpredictable and fully colored way the basic idea outlined in Pier and Ocean 4. Diagram B shows yellow planes which look like different versions of the same entity or the "same" entity in a state of becoming, constantly changing in appearance: the one and the many. The one and the many squares we have seen in Pier and Ocean 4 and in Composition with Large Red Plane. 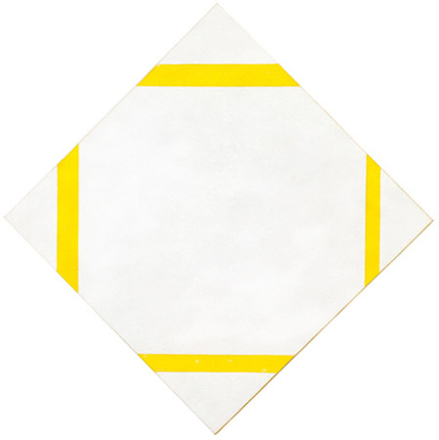 The one and many squares implicitly conveyed by Lozenge with Four Yellow Lines become now fully evident and not only in yellow. 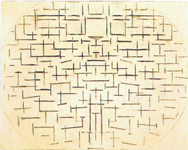 A significant difference with respect to previous neoplastic works consists in the almost complete absence of continuity in the lines, which are reduced to seven horizontal and two vertical rectilinear sequences. Lines and planes are now one and the same thing. The lines hint to planes in Lozenge with Four Yellow Lines and in Victory Boogie Woogie everything is expressed by means of planes. The balanced and the imbalanced relations between opposites which have been sketched in with black lines in Pier and Ocean 4 blossom here dramatically taking on the full range of colors, variable dimensions, proportions and reciprocal relations. A truly infinite "landscape" which at the same time represents the outer and the inner world. A lifetime evolution from black lines (1914) to colored planes (1943), that is to say, from drawing to painting. Where does Pier and Ocean 4 come from? Further details of this evolution process at this page.